The remaining Amazon Native nations in Peru -- some 350,000 people who depend on fishing and hunting in mostly clean rainforest areas they held for centuries -- appeared set May 7 for more uneven confrontations after the Peru Navy rammed and destroyed the river barricades they had set up April 9 to protest laws that Natives say threaten their survival. According to the Peru ombudsman's office in Lima, on May 4 a Peruvian Navy ship "broke the barrier that kichuas and arabelas had set up in past weeks as part of a Native protest." Natives wanted to prevent river traffic as part of efforts to halt activities in the Amazon to protest new Peruvian laws that allegedly ease the exploitation of oil, lumber and gold available. On May 4, a Navy ship broke ropes and crushed canoes that had been tied there in past weeks to prevent transit. AIDESEP, the Native organization coordinating the protests reported that, as a result, three retained ships used by oil company Perenco were able to continue on their way. Perenco officials declined comment. 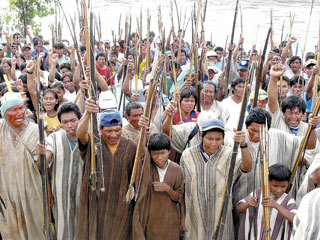 AIDESEP said that in retaliation, Natives are preparing as many as four new barricades in the same waterway. A Peru Navy official denied any violence in the opening of the barricade, claiming it wanted to open the waterway for transit. A later report assures that the Peruvian Navy will be on patrol to prevent more barricades in the area. Last year, when President Alan Garcia's administration was about to complete a long-awaited free trade accord with the U.S., he received special powers to get laws needed to implement the accord quickly. But those powers were "also used to enact separate, unrelated legislation," said Carlos Monge, a researcher at local think tank DESCO. He is studying the conflict, and is also a member of an organization named Revenue Watch Institute, which according to its Web site "promotes the responsible management of oil, gas and mineral resources for the public good." The 2009 protests are a repeat of protests in mid-2008 which, at the start, where neglected by the government until Natives occupied gas platforms owned by Argentina-based oil company Pluspetrol in an Amazon area known as Block 56. Peruvian officials rushed to end the protests by promising that Congress would work to repeal the laws they feared. But Congress never acted. In mid-2008, Pluspetrol had a new gas extraction platform in Block 56 that it could not access as it was occupied by thousands of Natives. Pluspetrol demanded help from the Peruvian government to make the country viable for investment again by improving security. AIDESEP spokesman Edson Rosales said Natives had intended to carry out blockades, but not occupations in this year's protests. But Natives occupied pumping stations of the only Peruvian crude oil pipeline which, since around April 24, was forced to shut, according to Natives and other industry sources. Peru's state oil company Petroperu, which owns the pipeline, has not said anything about any crude pipeline shutdown. The National Society of Mining, Oil and Energy -- which groups several companies operating in Peru including some operating in the Amazon -- said it did not have any comment on the protest. In mid-April, Garcia met with the president of France-based oil company Perenco, which has plans to develop an area of the northern Peruvian Amazon as well as build hundreds of kilometers of new pipeline through rainforest to move the crude they expect to be producing by 2013. In early May, Garcia met with the president of Spain-based oil company Repsol YPF, who informed Garcia of the company's plans to develop oil and gas exploitation areas in the northern and central Peruvian Amazon by investing as much as $500 million annually within the next five years. In mid-April, Garcia also hosted a contract signing ceremony where he welcomed oil and gas investors from several countries. The contracts signed included accords with officials from India, South Korea, Ireland, Vietnam, England and Canada which will do seismic testing and later drill areas of the central Amazon. Contracts were also signed with companies from Spain, Australia and the U.S. for similar efforts in the north Amazon. Yet Garcia had not met with Natives as of May 6 or made any comment regarding the protests in his nearly daily speeches. Monge said that such government posture appears to be setting up a confrontation. 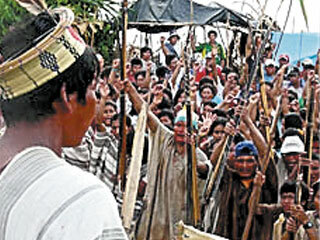 Mamerto Maicua, a Native leader in the northern Peruvian Amazon, said the Natives were readying more actions including the possible occupation of the airport in the city of Tarapoto as well as blockades of the only Peruvian Amazon highway. "These actions are a reply to being treated as if we did not exist."